Plantar warts are growths on the bottom of your foot caused by an infection with human papilloma virus, or HPV. A wart can look and feel like a callus that can be small or large. Warts have characteristic “black dots,” which are enlarged capillaries that are best seen when the wart has been trimmed down. HPV is the virus that causes warts. Often the virus will enter the body through a small opening while the person is barefoot in an area that the virus is present. 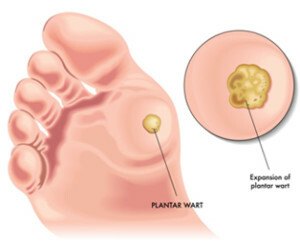 The symptoms of plantar warts include: Small, bumpy growths on the soles of the feet, sometimes with tiny black dots on the surface and in the soles of the feet when standing or walking. Plantar warts tend to be painful on application of pressure from either side of the lesion rather than direct pressure, unlike calluses (which tend to be painful on direct pressure instead). Don’t go barefoot in public areas. Wear sandals or flip-flops in public pools and locker rooms. Don’t use the same file, pumice stone or nail clipper on your warts as you use on your healthy skin and nails. Freezing (cryotherapy): Your doctor can apply liquid nitrogen with a spray canister or cotton-tipped applicator to freeze and destroy your wart. The chemical causes a blister to form around your wart, and the dead tissue sloughs off within a week or so. The application itself can be painful, and cryotherapy can result in painful or tender blisters that resolve on their own. Cantharidin: Your doctor may use cantharidin — a substance extracted from the blister beetle — on your plantar warts. Typically, the extract is paired with salicylic acid, applied to the plantar wart and covered with a bandage. Your doctor clips away the dead part of the wart in 3 – 5 days. Immunotherapy: This therapy attempts to harness your body’s immune system to remove tough-to-treat warts. This can be accomplished in a couple of ways. Your doctor may inject your warts with interferon, a medication that boosts your immune system’s instinct to reject warts. Or your doctor may inject your warts with a foreign substance (antigen) that stimulates your immune system. Doctors often use mump antigens, because many people are immunized against mumps. As a result, the antigen sets off an immune reaction that may fight off warts. Interferon treatment may result in flu-like symptoms for a few hours after treatment. Both treatments may cause pain. Imiquimod (Aldara): This prescription cream applied directly to a wart is an immunotherapy medication that encourages your body to release immune system proteins (cytokines) to attack HPV. This treatment can result in severe inflammation near the site and damage to the tissues beyond the wart. If this occurs, the treatment is dropped. The drug may also result in flu-like symptoms that may lessen with a lower dosage. Minor surgery: This involves cutting away the wart or destroying the wart by using an electric needle in a process called electrodesiccation and curettage. Your doctor will anesthetize your skin before this procedure. This treatment is avoided if possible with plantar warts because of the risk of scarring. Laser treatment : A type of laser treatment called pulse dye laser treatment burns closed (cauterizes) tiny blood vessels. The infected tissue eventually dies, and the wart falls off. This treatment can cause pain and scarring.